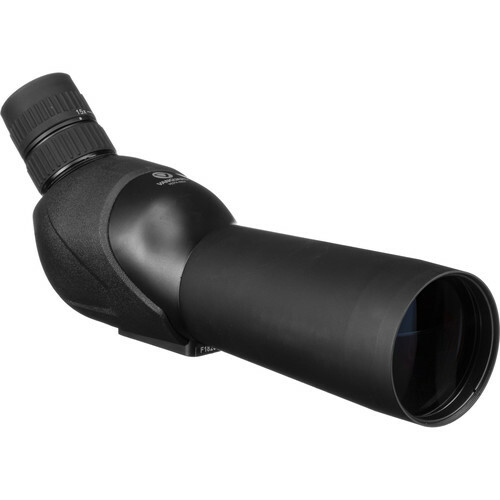 From the forest to the mountains to the concrete jungle, Vanguard designed the 45° angled viewing Vesta 460A 15-50x60 Spotting Scope, featuring the broadest magnification range in the series, to provide power and performance to new and experienced users alike for hunting, birding, and general glassing in all environments. Utilizing a generous 60mm objective lens and their Advanced MultiGuard lens coating system boosts its performance in low and challenging conditions while ensuring the views remain bright and clear, even when the magnification is dialed all the way up. Its broad zoom range allows you to enjoy a 125-foot field of view and more easily scan the landscape for targets at the low 15x with the ability to quickly dial up the power to an impressive 50x and make detailed observations of distant subjects. The chassis is made of a lightweight and durable aluminum alloy that is protected by a black rubber armor. The chassis is nitrogen filled and O-ring sealed to be waterproof and resistant to internal fogging even in extreme weather and temperature conditions. The angled-viewing configuration sets the eyepiece at a 45° angle to the scope's body, which places your head in a more comfortable viewing position versus straight-through viewing models. A 1/4"-20 mount makes it compatible with many tripods, quick release plates, and other popular support systems like window mounts, and Vanguard includes a compact tabletop tripod to get you observing right out of the box. A lightweight carrying bag makes it easy to take with you in the field. Box Dimensions (LxWxH) 12.3 x 6.8 x 4.5"